Experience the most spectacular holiday event of the season! 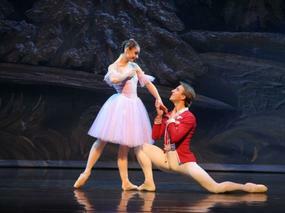 The definitive holiday tradition for families, couples, and ballet lovers! Moscow Ballet's Great Russian Nutcracker has toured America and Canada for 19 years as the largest Russian ballet tour in North America. Averaging 100 performances during November and December, this coast-to-coast attraction combines the highest caliber Russian ballet, cutting edge production values and the traditional appeal that consistently fills theaters. With larger than life puppets, 9 hand-painted backdrops with 3-D effect, and hundreds of exquisite costumes, the Great Russian Nutcracker is the most spectacular Christmas celebration! New in 2011! Moscow Ballet has commissioned the creation of a new, full-length production of Romeo and Juliet. Set to Prokofiev's unforgettable score, and with scenic design by Sergei Yakimenko and costumes by Arthur Oliver, Romeo and Juliet will tour Canada in November. Stay tuned for more information about Moscow Ballet's stunning new production of Romeo and Juliet. The Great Russian Nutcracker is a unique event that captures the holiday spirit of Christmas. Audiences keep coming back for more of this yearly tradition. The company performs annually in most major US markets, including Los Angeles, Chicago, San Francisco, Detroit, Dallas, Washington DC, Minneapolis, Baltimore, Tampa Bay and many more. Check to find a performance near you. Moscow Ballet's Great Russian Nutcracker provides an opportunity for up to 60 local children to perform with the professional company in walk-on roles. Moscow Ballet soloists travel the United States before the tour each fall to audition and rehearse the children and prepare them to perform with the professional Russian company of forty dancers. This provides a once in a lifetime experience and memory for the young dancers. Interested in having your dance school work with Moscow Ballet? Get in touch!